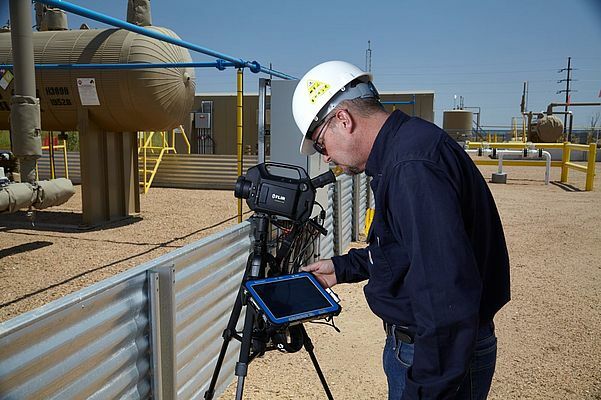 FLIR Systems GF-Series Optical Gas Imaging (OGI) cameras are being used by the oil and gas industry to quantitatively measure methane emissions and create a datum point for future methane reduction calculations. FLIR Systems, in partnership with Providence Photonics, has developed Quantitative Optical Gas Imaging (qOGI) technology, which is designed to work exclusively with FLIR GF-Series OGI cameras. Quantitative OGI represents a critical step forward in the world of optical gas imaging because it eliminates the need for secondary sampling devices to quantify gas emissions. Methane leaks from oil production gas flaring can be visualized using the new FLIR qOGI technology at distances of up to 100 feet (33 meters) as long as you’ve got line of sight. According to a recent study by CONCAWE (the European Oil Company Organization for Environment, Health and Safety), qOGI technology has a 6 per cent error rate on average, while a traditional sniffer had a 31 per cent error rate.